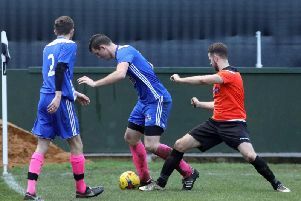 Desborough Town’s Buildbase FA Vase hopes were ended for another season as they slipped to a 3-2 defeat at Cadbury Athletic. Ar Tarn fell 3-0 behind in the third-round clash but almost pulled off an unlikely comeback as they scored two late goals, although they were unable to find an equaliser. 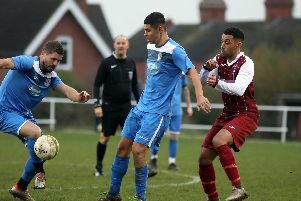 It was a fine day for Rothwell Corinthians in the Future Lions United Counties League Premier Division as they claimed a 3-1 success at Kirby Muxloe. Two goals from Adefolarin Ademidum and one for Colum Nugent gave Jim Scott’s a second win in three matches and moved them to within a point of safety. Whitworth remain bottom, however, after they were well beaten 5-0 at home by Eynesbury Rovers. In Division One, a Nathan Heycock goal wasn’t enough for Irchester United as they went down 2-1 to Huntingdon Town at Alfred Street. And Burton Park Wanderers were also on the end of a defeat as they were beaten 3-0 at Birstall United. Rushden & Higham United booked their place in the last eight of the NFA Junior Cup as they saw off UCL Division One rivals Thrapston Town 2-0 at Hayden Road. Jack Dyson and Nat Gosnal-Tyler scored the goals to send the Lankies through.